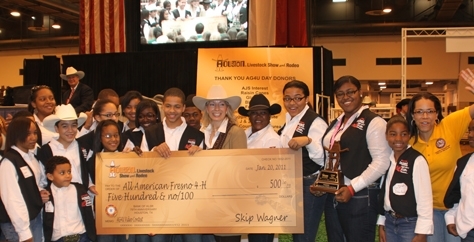 Alecea Rush, CEP communications specialist, far right, is pictured with the Fort Bend County All American Fresno 4-H Club as they receive the $500 award from the Houston Livestock Show and Rodeo for winning 1st place in the 2011 AG4U Video Challenge. Excitement resonated among the Fort Bend County All American Fresno 4-H Club as members were proclaimed 1st place winners of the 2011 AG4U Video Challenge and awarded $500 at the Houston Livestock Show and Rodeo on March 8th. Participants in the contest had to develop a video depicting what being an ambassador for agriculture meant to them and their communities. The All American Fresno 4-H Club is one of the clubs that operates under the direction of Timothy Sandles, Extension agent – 4-H & Youth with the Prairie View A&M University Cooperative Extension Program. “I also appreciate the assistance of Alecea Rush, communications specialist, Prairie View Cooperative Extension Program, who showed the club members how to use and operate a video camera,” Sandles said. There were numerous youth groups attending the awards ceremony including 4-H and FFA groups. All of the students had a chance to interact with Texas Commissioner of Agriculture, Todd Staples, during a question and answer session. Staples talked about the youths’ future in agriculture and asked them about potential opportunities that they wanted to pursue. He also asked about their viewpoint on how technology and agriculture interact. This entry was posted on Thursday, March 17th, 2011 at 6:20 pm and is filed under 4-H & Youth Development, Agriculture and Natural Resources, Uncategorized. You can follow any responses to this entry through the RSS 2.0 feed. You can leave a response, or trackback from your own site.